If you are planning to travel to old San Juan, you are in for a real treat. 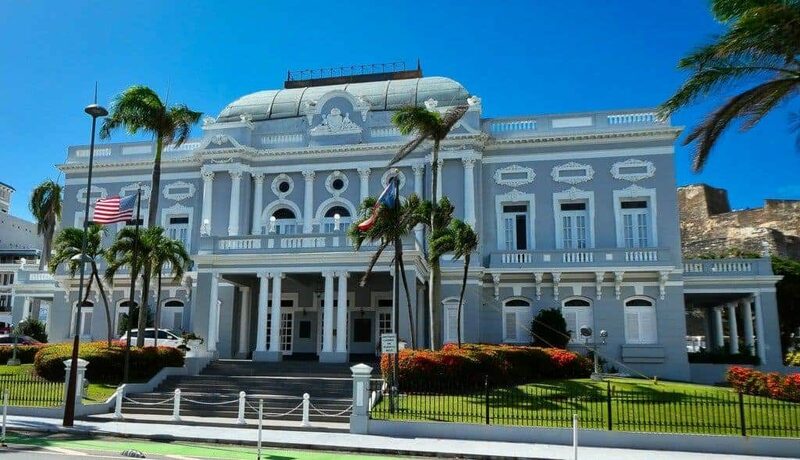 Located on the northern coast of the island, San Juan is an architectural, social and cultural dream. Old San Juan became a city almost a century before the Mayflower landed in what is today Massachusetts. 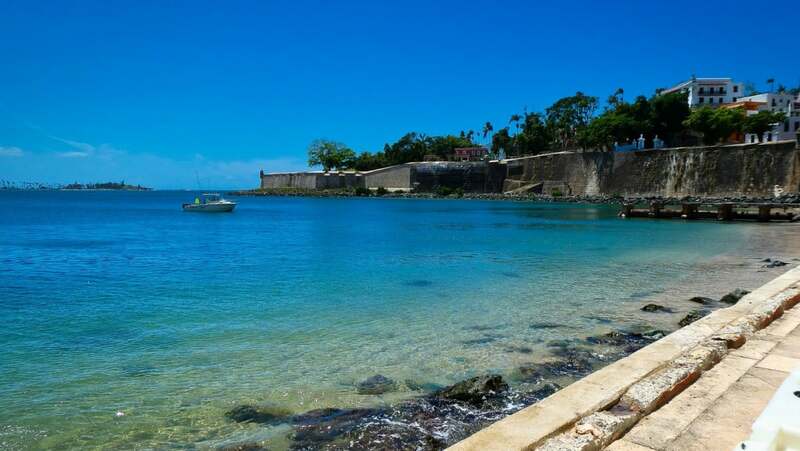 San Juan is the second oldest European settlement in the Americas and the oldest under US jurisdiction. The city is rich in cultural heritage and charm. Its breathtaking beauty is an experience everyone should have. In early September 2017, Hurricane Maria, a Category 5 storm that formed quickly after Hurricane Irma, hit San Juan hard; it was the strongest hurricane to make landfall in Puerto Rico in 89 years. The island suffered great damage and is still working on making repairs. 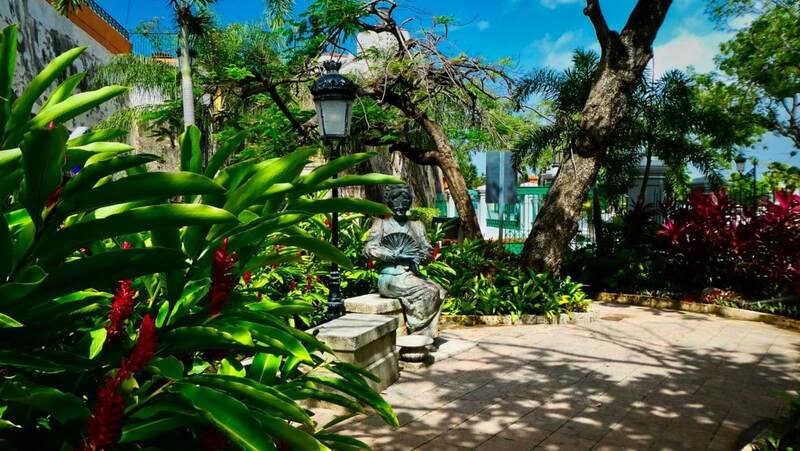 We are here to tell you that old San Juan is in great shape and just as beautiful as ever. The people as well as the buildings of old San Juan are resilient. What else would we expect from a city that has endured storms, pirates, and wars for centuries and always rebounded? We are not saying that the whole island is back to normal, but if you are thinking of a visit to old San Juan, we say do it. Most Importantly, Old San Juan is as beautiful and captivating as ever. We just visited. It was the peak of tourist season yet we did not find crowds. Many of the people of San Juan make their living from tourism, so if you want to help the people, visit old San Juan. 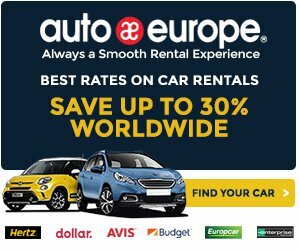 How much does it cost to take a taxi from the airport to old San Juan? Normally it is $21 plus $1 per bag. A $2 night surcharge is added from 10pm – 6am. San Juan also has Uber. We used it frequently while we were there. 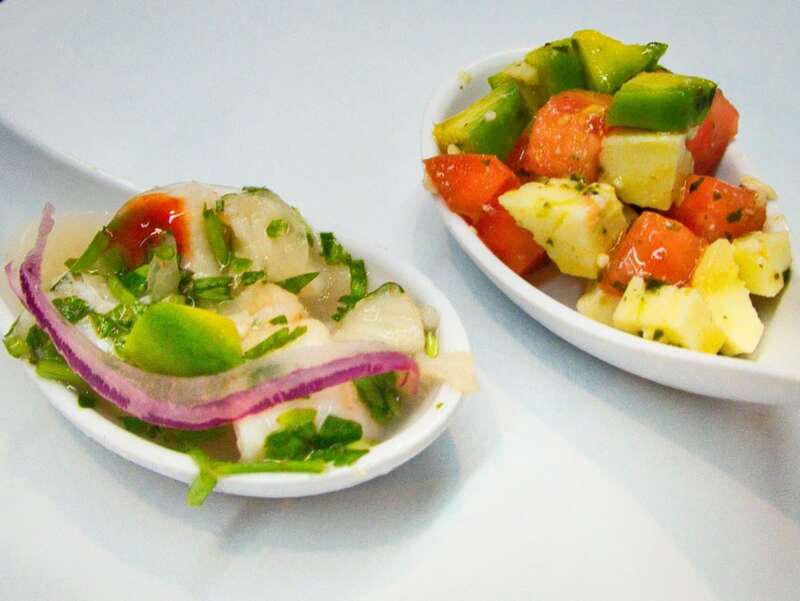 We highly recommend the Flavors of San Juan Food Tour. The guides at Flavors of San Juan share their Old San Juan experiences and discoveries with you while tasting the unique foods of Puerto Rico. We arrived for our tour at a plaza in Old San Juan. Our tour consisted of four couples, all of us American but from all over the US and of course, Keith and I from Ecuador. Our guide Shannon came from the US six years ago, on vacation and never returned. She loves the island, its people, its food, and its history. She had three goals for all of us. We had to have fun, have a better understanding of the history and culture of Old San Juan and not to be hungry when we finished the tour. I am happy to say, we achieved all the goals. 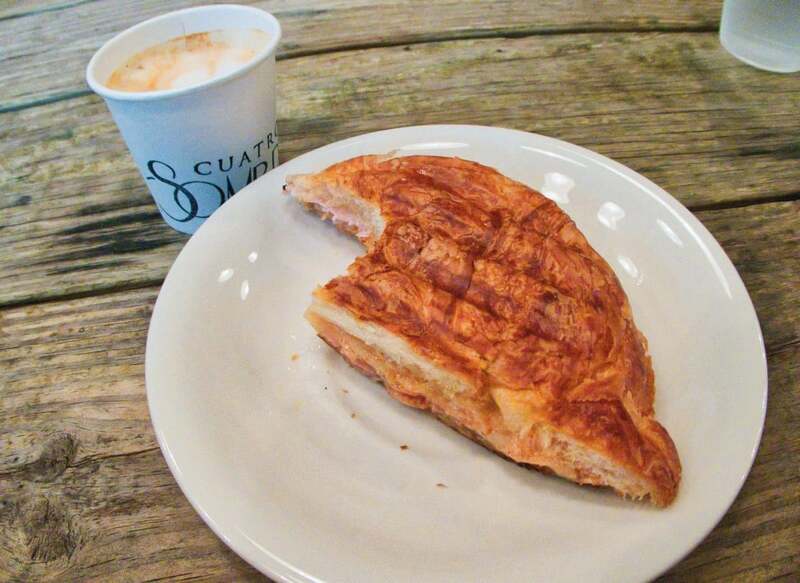 Our tour began with a quick history lesson, and then we were on to Café Cuatro Sombras where we sampled a Croissant sandwich with ham, cheese, and guava butter and a Cortadito, a coffee with a little bit of milk and some fresh fruit. Even though he loved everything on the tour, the sandwich here was Keith’s favorite. Café Cuatro Sombras believes coffee is an essential part of Puerto Rican culture, history, and lifestyle. Our next stop was not a restaurant but one of the most unique shops I have ever been to, the Butterfly People. 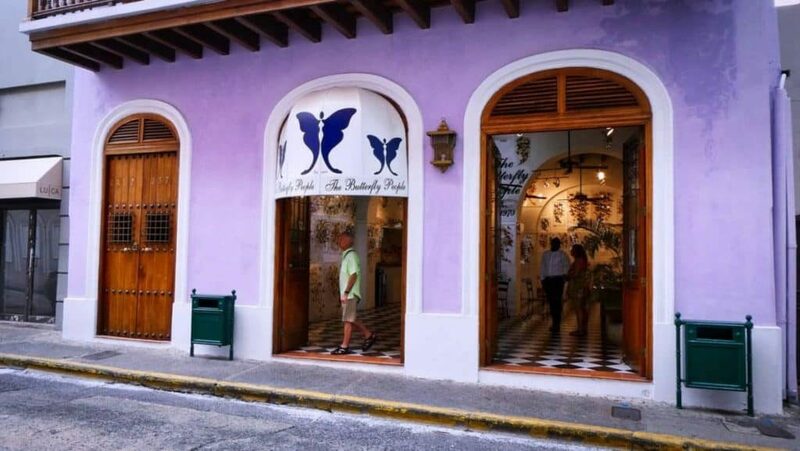 The Butterfly People with world’s largest butterfly collection are located in a beautifully restored Spanish colonial mansion at 257 Calle de la Cruz. 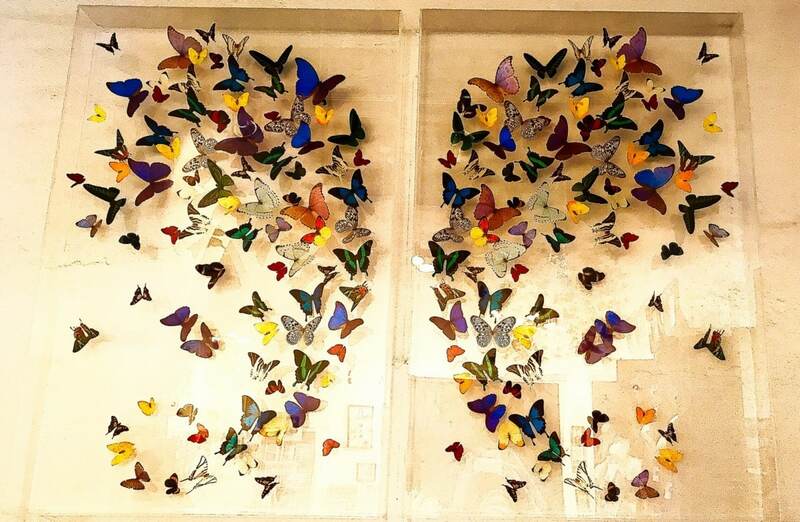 This gallery creates butterfly art boxes with real butterflies raised in the tropics. The tropical butterflies used in Butterfly People’s works come from farms and ranches throughout the world and have naturally completed their short lifespan. Their art is extraordinary and makes a great conversation piece. Our tour started at 3 pm, which I think, is a perfect time for this culinary adventure. Our second stop was for popsicles at Señor Paleta. Senor Paleta specializes in the creation of handmade popsicles of gelato and sorbet. They use a variety of flavors of fruits and nuts. 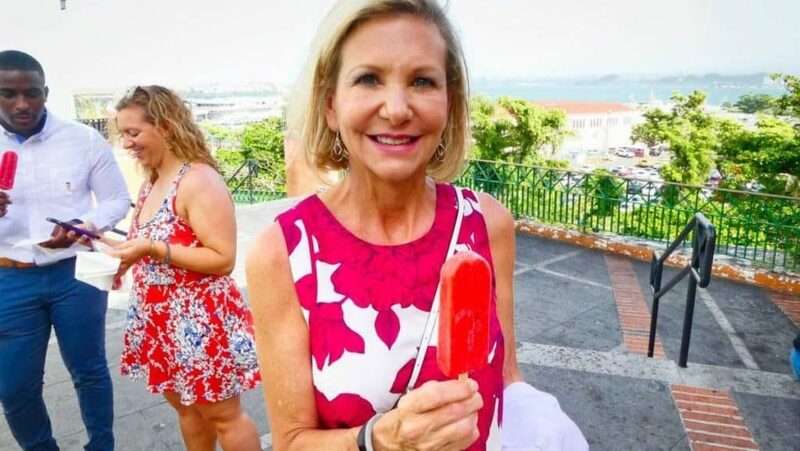 We had a strawberry mojito popsicle as we gazed upon a view of San Juan and heard more about its fascinating history. 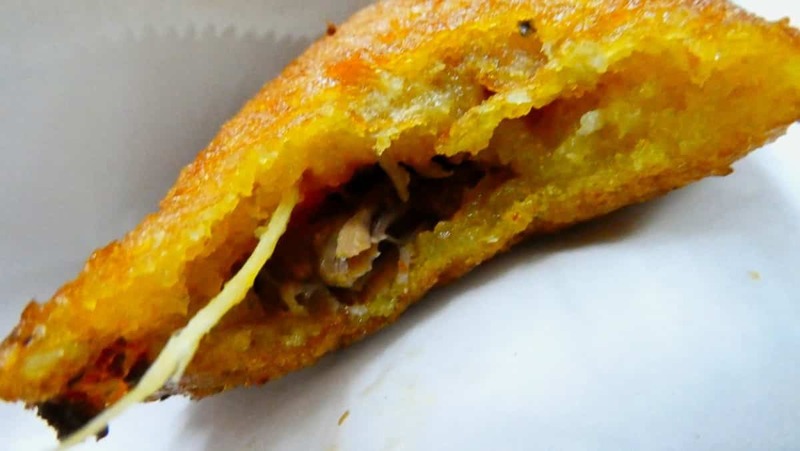 Next, we had our first ever Aalcapurria which is a deep-fried pocket sandwich with either veggies or ground beef at Café El Punto. Then we tasted their ceviche. I try to eat vegan, and throughout the whole tour, they accommodated me. Keith had ceviche with fresh grouper, and I had a Caprese salad made with tomato and avocado. 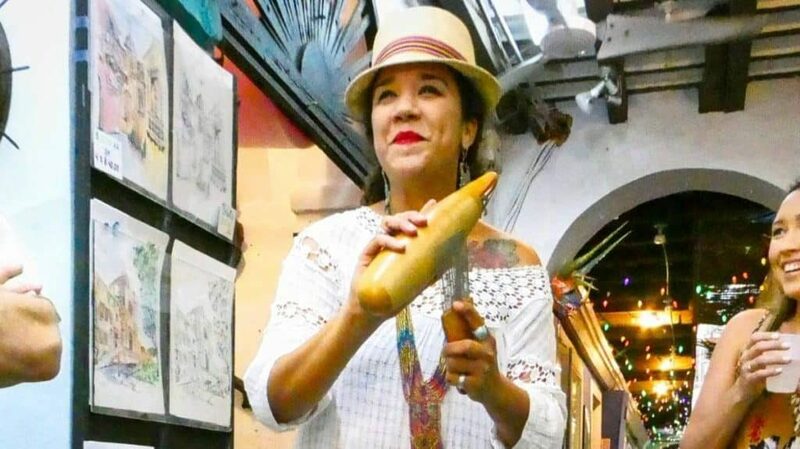 At Café El Punto they create creole lunches prepared with only fresh ingredients made the way their grandmothers did in the traditional Puerto Rico kitchens. We made an unscheduled stop at the request of our group, and it was at Ole, a Panama hat shop. Now here I must digress a bit. Panama hats originated in the city Keith, and I call home today, Cuenca, Ecuador. Today this is still where they make the best Panama hats, and I wanted to see where they made Ole’s Panama hats. 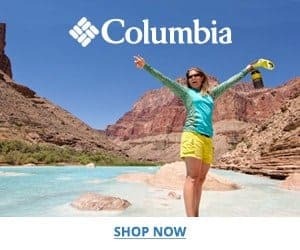 I was happy that the owner, Guillermo Cristian said: “all of the hats in my store come from Cuenca, Ecuador.” Here you can buy a genuine Panama hat made in Cuenca and customize it yourself. There are many knock-off Panama hats from China. 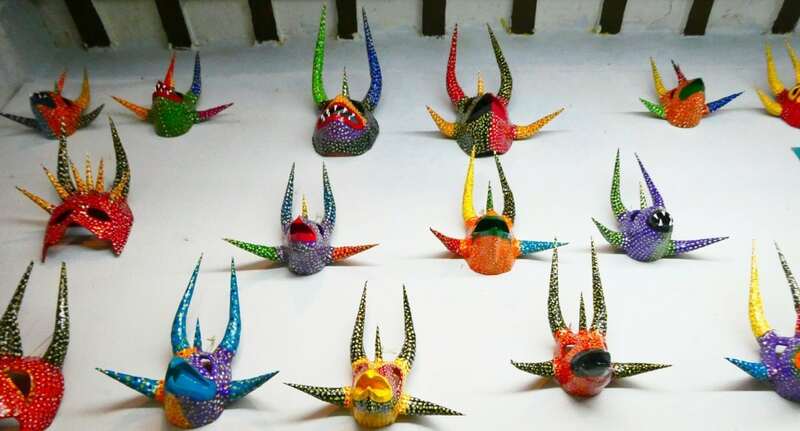 The ones made in Cuenca are handmade and will last a long time. Originally Panama hats were taken to Panama City from Cuenca because it was a prime export hub in the early years of the Panama hat industry. It would take many weeks for the hats to reach Panama because horses transported the Panama hats from Cuenca to Panama. From there, we were on to Cafe del Angel to have and make mofongo. Mofongo is San Juan’s unofficial national dish. Mofongo’s basic ingredients green plantains and sweet capsicum grow in abundance in Puerto Rico. But before our mofongo, we had a house mojito. Fantastic! Our group, which I have to say by this time all became fast friends, had chicken mofongo with rice and beans. I had a vegetable mofongo also with rice and beans. 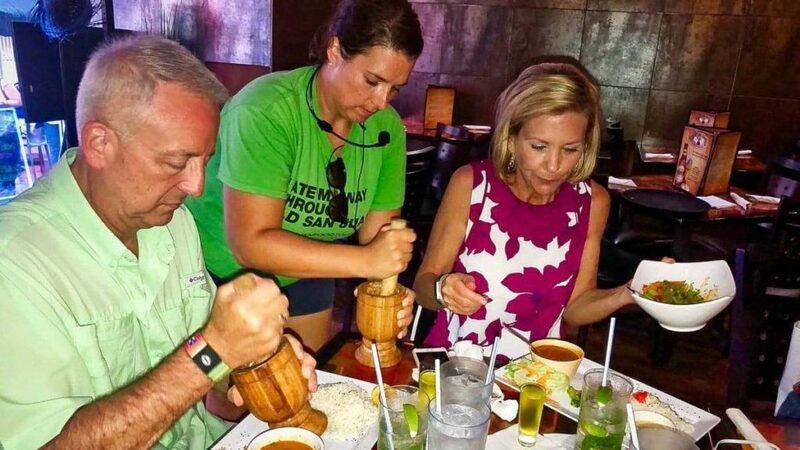 Our fried plantains arrived in a wooden mortar, and we used a pestle to smash them. To that mixture, I added garlic and oil while the others added chicken and garlic. Mofongo is a very garlicky dish that goes perfectly with the beans and rice. We could see why Puerto Ricans love this dish! To top it off, one of our new friends, Hunter, bought our whole group a shot of Chicharito which is typically a shot made of rum and anise liquor. However, ours was lemon flavored. Hot Chocolate and Cheddar Cheese Anyone? All good things must come to an end. We finished our tour with dessert at Chocobar de Casa Cortés. Located in the heart of Old San Juan, Chocobar Cortés is a new restaurant concept where chocolate has the starring role! And not just any chocolate, they use Chocolate Cortés, which is a family-owned business that has made farm-to-bar chocolate in the Caribbean since 1929. Here we had hot chocolate, churros, chocolate, and cheese but let me explain. First, we had hot chocolate, not hot cocoa, very different. 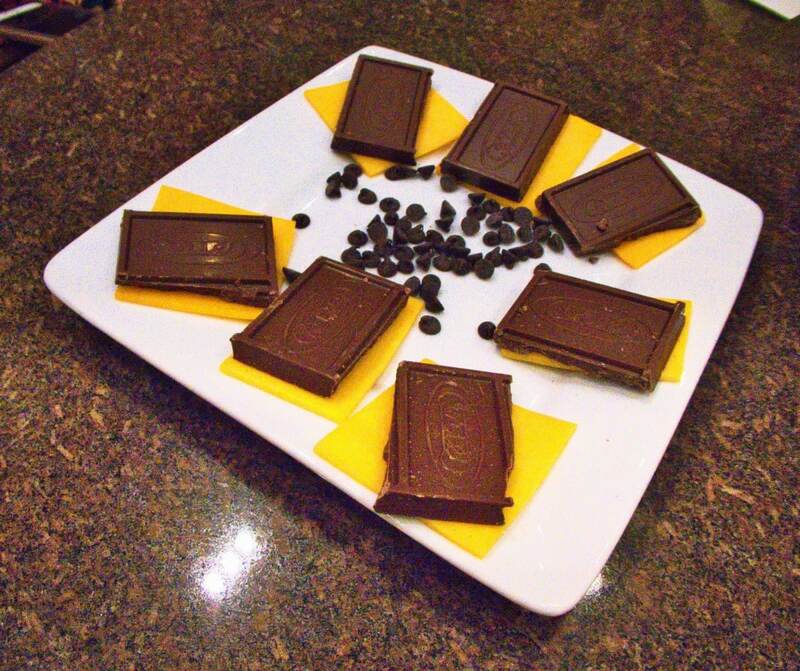 If you love chocolate, this is for you! We put the cheese into the hot chocolate and gave it a minute to soften. Then we used the churro to dip into the hot chocolate and wrap the melted cheese around the hot chocolate soaked churro. Sounds weird but the entire group loved it. As I said, in the beginning, we were four couples that did not know each other, but by the end of the tour, we were all great friends. That’s a side benefit of intimate small group tours like this. Since everyone loves animal stories, I have to tell you about one that happened during the tour. As we were walking down this street listening to Shannon, we saw a dog walking by himself that looked homeless. 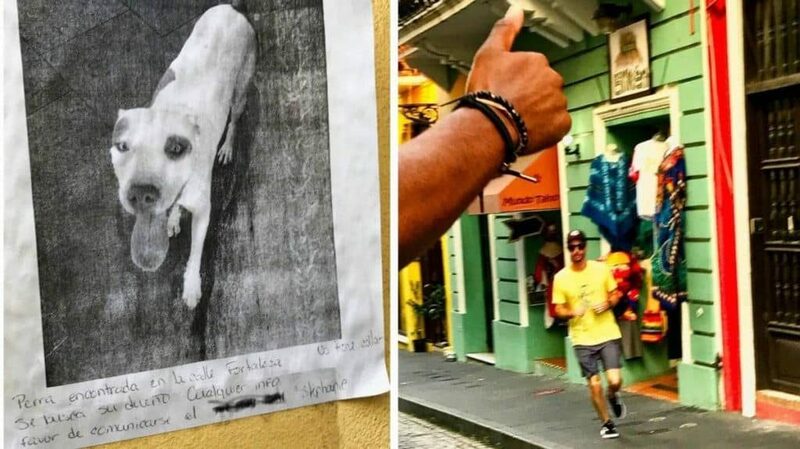 About a minute later we all noticed this sign someone hung on the wall for what we all thought was for a lost dog. It had a picture on it of the dog that just walked by us. We were all upset that someone had lost their dog. Hunter, the guy who bought us the drink, tore off after the dog running as fast as he could in hopes of returning the dog to its owner. Soon he was rounding the second block. Just then, Shannon our tour guide actually read the message that was in Spanish on the flyer. It said, “a lost dog is hanging around the neighborhood and if you know anyone looking for a dog that matches this description I will happily show you where I frequently see him.” Luckily Hunter’s wife was able to call him to tell him to call off the chase. He ended up catching up to the dog, but the dog had no intention of letting Hunter pick him up. We all had a good laugh as to what we thought was going to be a happy ending. Things like this speak volumes to one’s character. We were fortunate to meet six amazing people. So one of the best parts of this tour was making new friends. After all, in the end, life is about the people you meet and the good times you share! 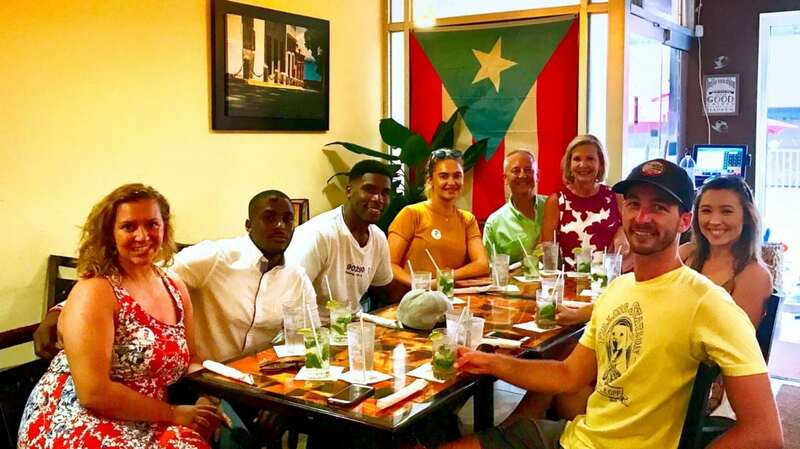 And there’s no better way to meet new people than on a food tour with Flavors of San Juan. 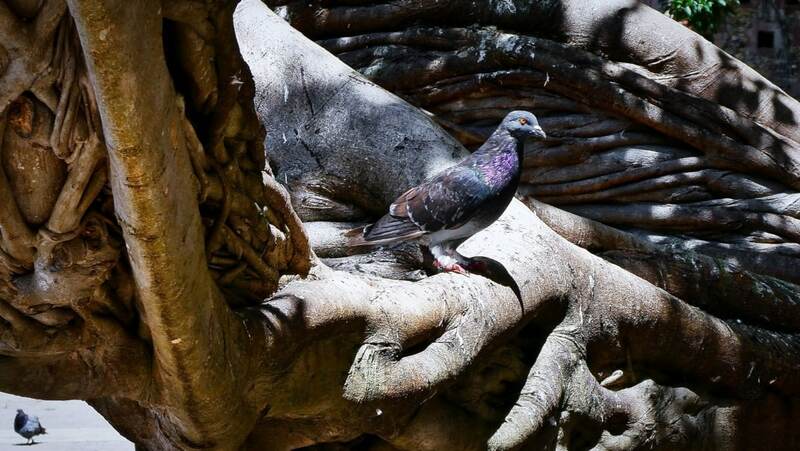 Before we left our new friends, we asked them what they thought of Old San Juan? 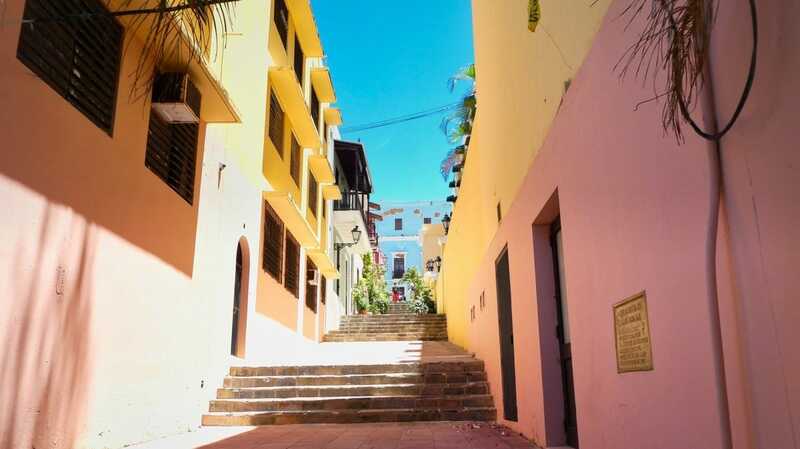 They all responded that they loved the colors, the tastes and the vibe of Old San Juan. 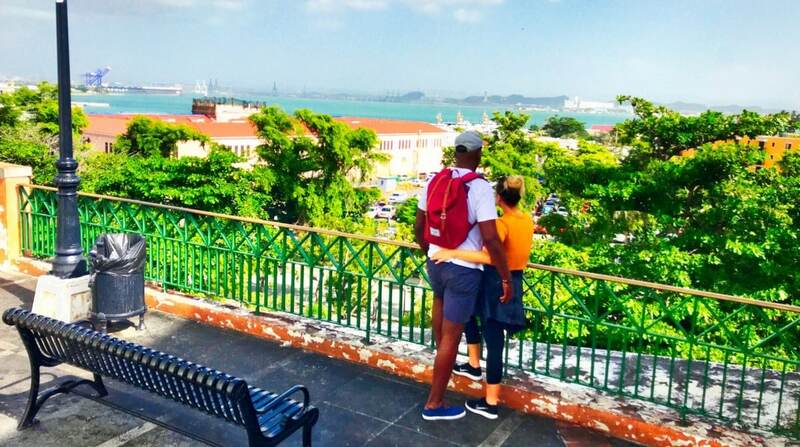 And that Old San Juan has more than 500 years of history and beautiful colonial architecture painted in tropical colors making it one of the most romantic yet exciting Caribbean destinations. They all agreed that it was ready for tourists. 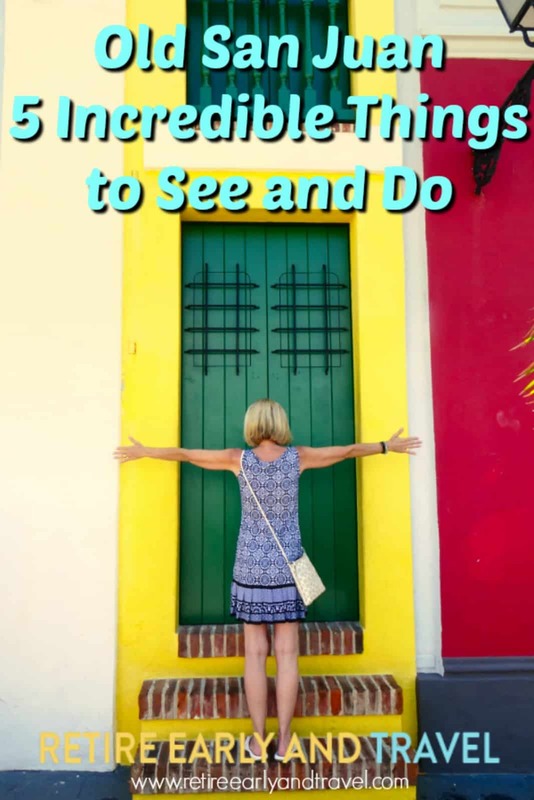 A great way to explore Old San Juan is on an Old San Juan Free Walking Tour. Whenever we visit new cities, we always do the free walking tours. The Old San Juan, Free Walking Tour, aims to transport you back to the 16th Century when Puerto Rico was a Spanish colony. By taking this tour, you will learn about the different forts the Spanish built to protect the island from enemies. 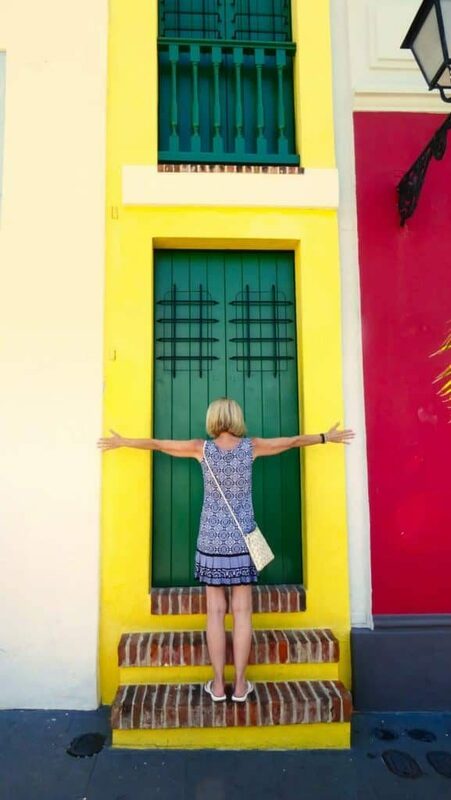 On this tour, you will traverse the narrow, cobblestone streets of old San Juan and take in the beauty of its pastel-colored buildings and Spanish architecture. Zara is the owner and tour guide of the free walking tour. She is knowledgeable, friendly and engaging. You can tell she loves what she does. As our tour began, Zara transported us back to the 16th century. Back to when Puerto Rico was a Spanish colony. As we walked through the colorful streets, we learned about the 19th Century urbanization. It was fascinating to learn about the customs and tradition both old and new. Something special that Zara had prearranged for us to do was to visit Siervas de Maria. 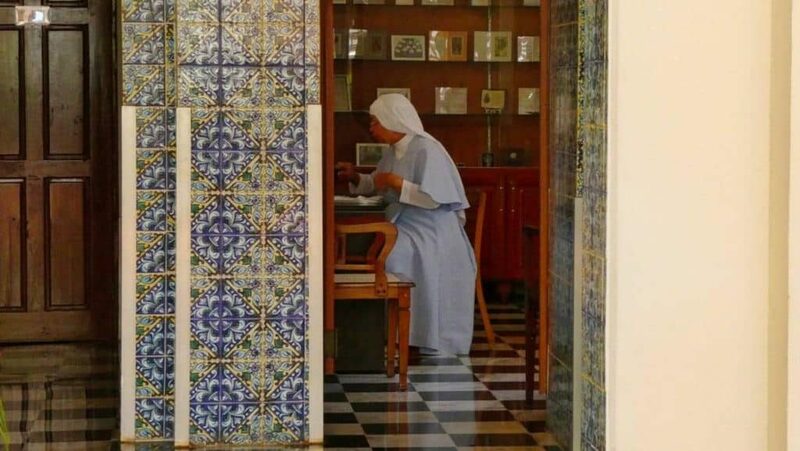 Siervas de Maria is a nursing home and recovery center managed by a group of nuns who are nurses. Dedicated to the care of the sick and needy no one is ever turned away from their door in need of nursing or first aide. A sister, dressed in her habit, warmly answered the door. 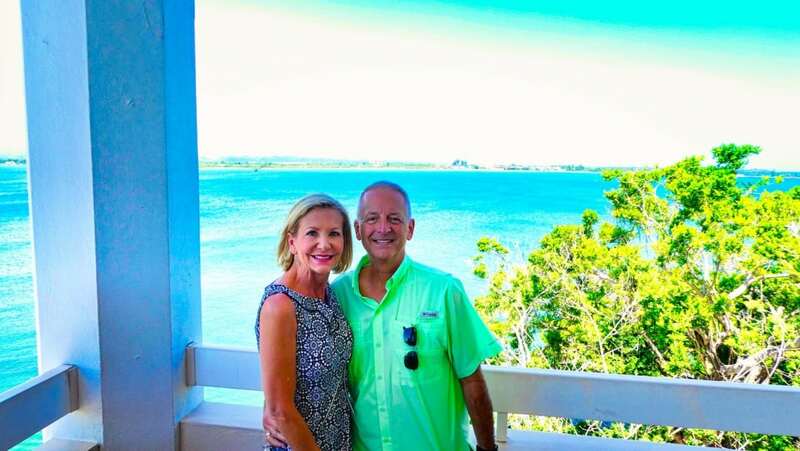 She escorted us through the building to a balcony where we had a magnificent 180-degree ocean view. Siervas de Maria is not open to the public. Visiting here was truly special. 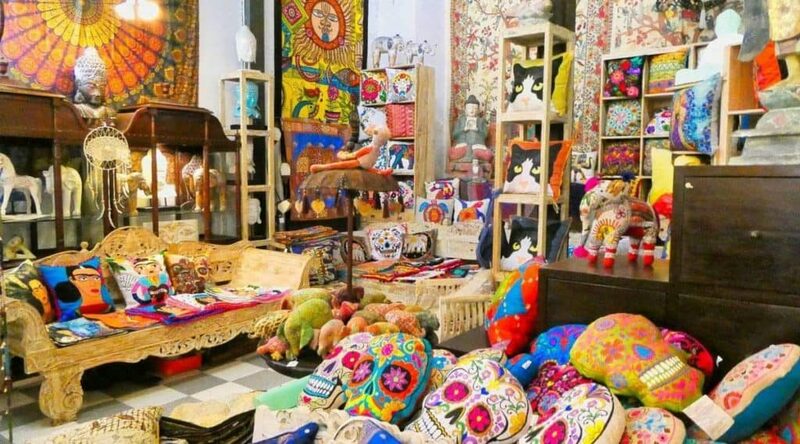 Another interesting stop on the walking tour is La Casa Estrecha located on Calle Tetuán. It is well known because it is the narrowest house in the Americas. Sandwiched between two much larger buildings, it is only 5 feet wide, 36 feet deep, and has two stories. It was originally the alleyway between the two buildings. 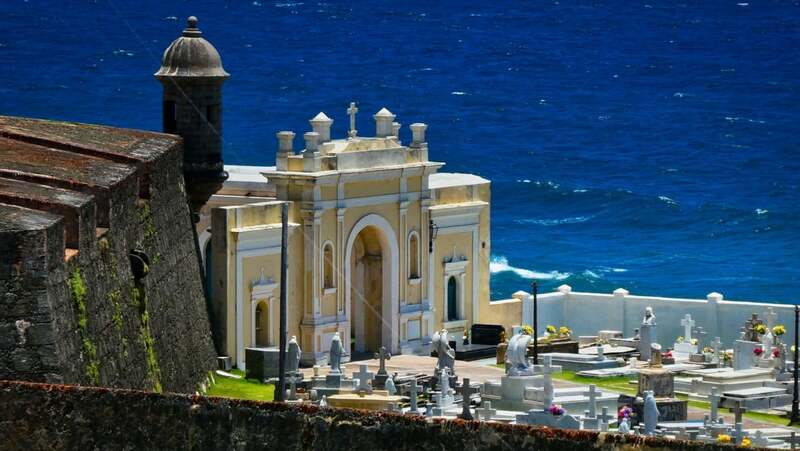 On this tour, you will get a view of the fort El Morro and the San Juan cemetery. Zara explained the history of both. 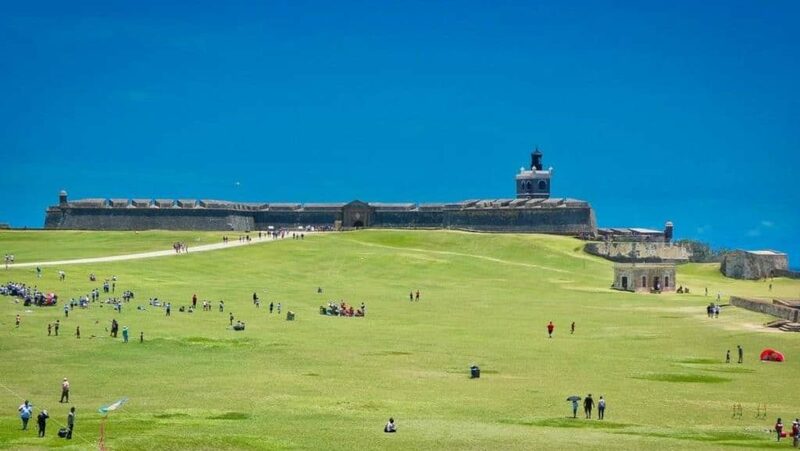 The fort is enormous and has a huge grassy area where you’ll most likely see picnicking and kite flying. 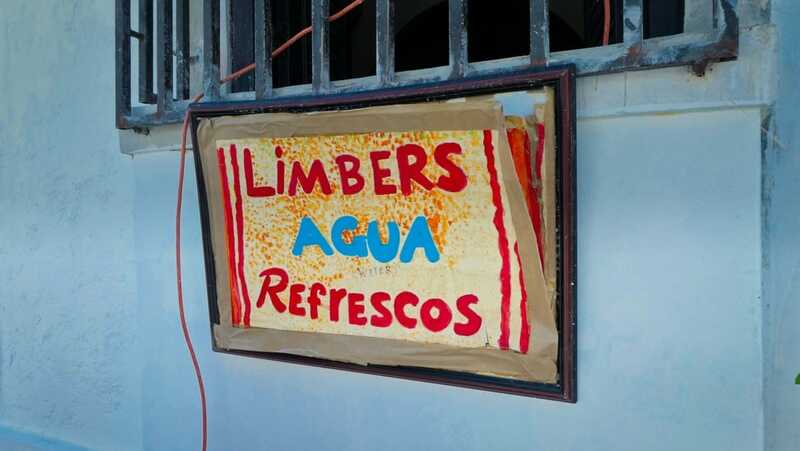 Close to the Cathedral of San Juan Bautista we visited this little tienda that sells Puerto Rican ice called Limbers. What exactly is a limber? It’s is the perfect combination of Italian ice, and a tiny bit sherbet served in a small paper cup. 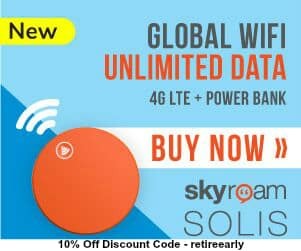 Get this; the cost is only 75¢. 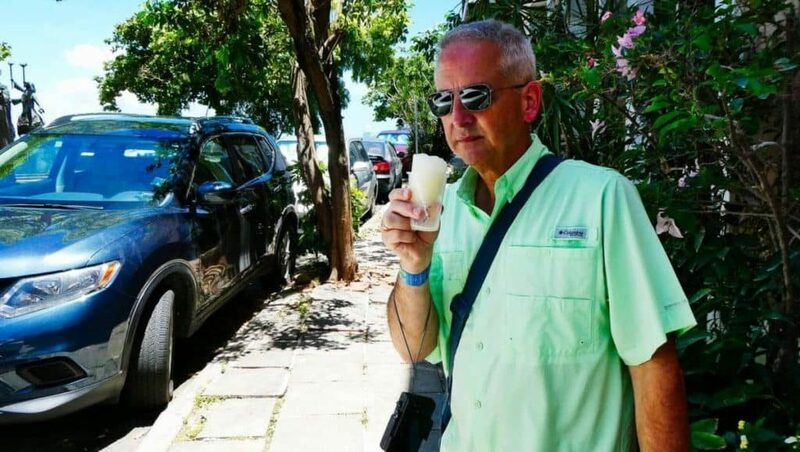 Eating a limber is delicious and refreshing especially because San Juan tends to be a bit warm year round. Eating a limber, you are experiencing history as this incredibly tiny place has been around for over 40 years. You have to have one when you visit old San Juan. They come in many flavors and taste great! Paseo de La Princesa promenade is one of my favorite spots in Old San Juan. 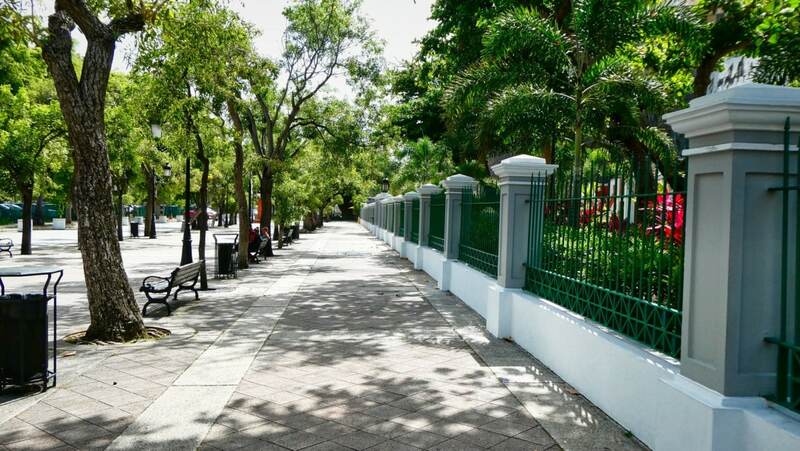 Paseo de la Princesa is located on the south side of Old San Juan near Plaza de Hostos and Plaza Darcenas Paseo and originally built in 1853. This restored 19th-century street is the place to stroll, people watch and take photos. The tree-lined walkway along Paseo de la Princesa provides plenty of shade making the walk quite enjoyable. Heading towards the water on the right are gates that open to a lovely garden with many places to take incredible photos. While we were there, street vendors were set-up under charming white tents. 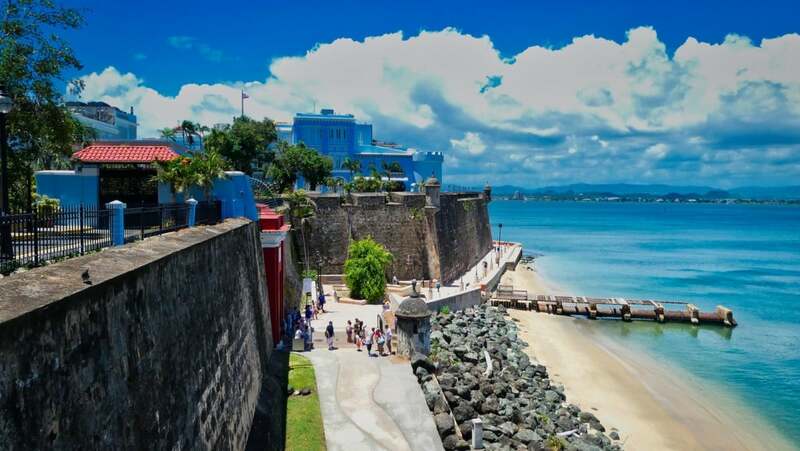 As you walk along Paseo de La Princesa, towering above you on your right is the 15 foot thick walls of Old San Juan and to your left is San Juan Bay. At the end of the street, you will find the magnificent Raices Fountain. 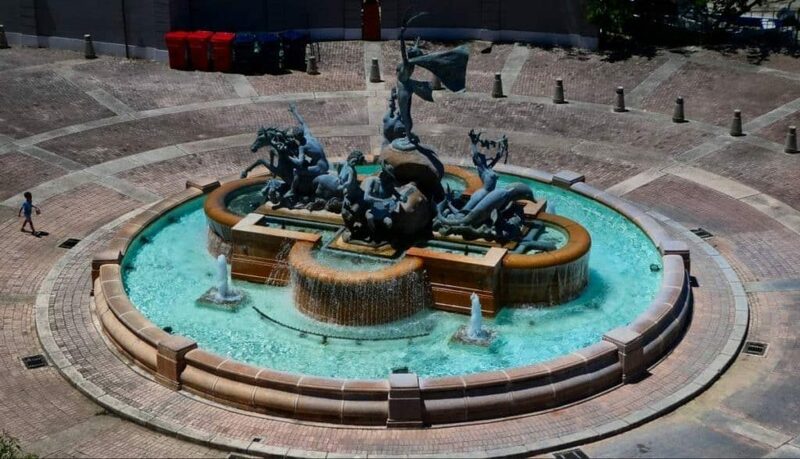 This fountain depicts the rich cultural diversity and heritage of Puerto Rico through the images of American Indian, Spanish and African people. From Raices Fountain continue walking along the much narrower but still beautiful path that is sandwiched between the walls of the city and the San Juan Bay. The views of the bay are extraordinary and photo-worthy as are the walled side of the path. The path ultimately leads you to the San Juan Gate which is the only remaining one of five gates into the walled city of Old San Juan. For centuries, this doorway served to keep invaders out of the city. 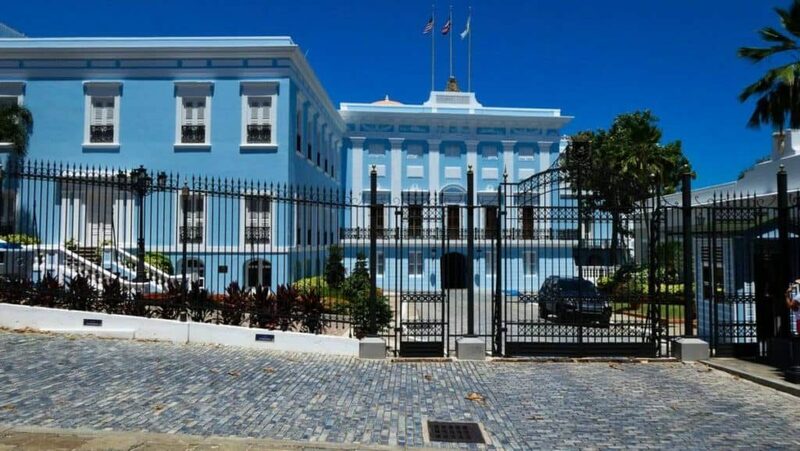 Today, coming from Paseo de la Princesa you can freely walk through the gate and explore the vibrant Old San Juan. Once you pass through the gate, a view of the San Juan Bay will great you. 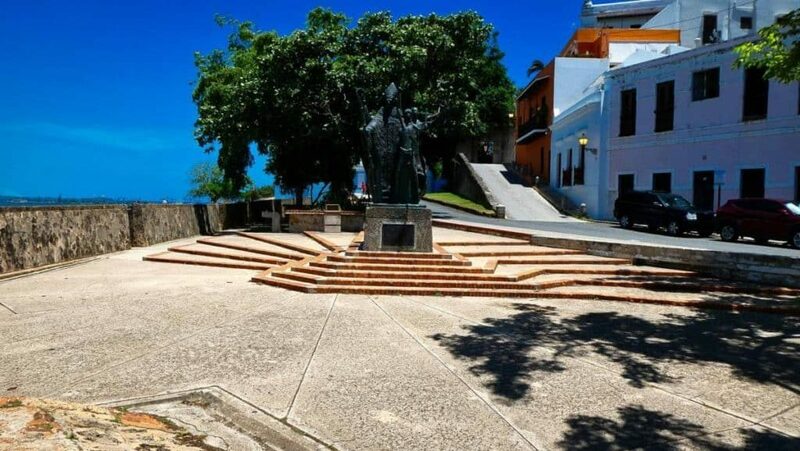 Located on the south side of Old San Juan, Paseo de la Princesa is near Plaza de Hostos and Plaza Darcena. 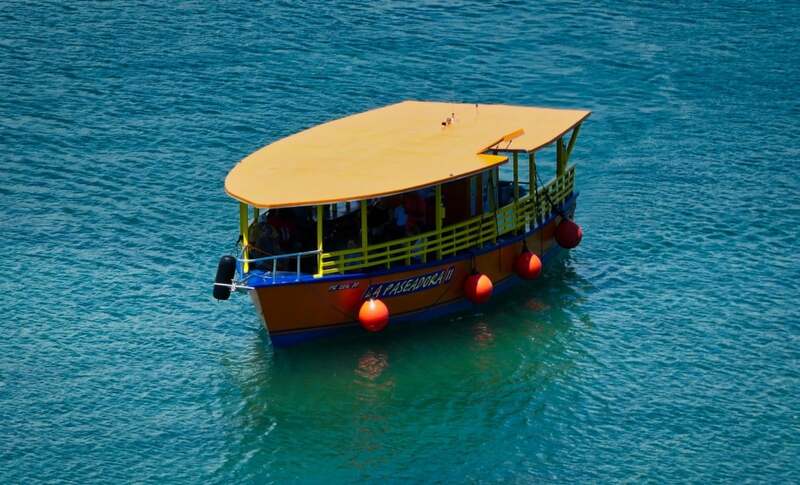 If you come to Old San Juan via cruise ship, it is just a short walk from the dock. 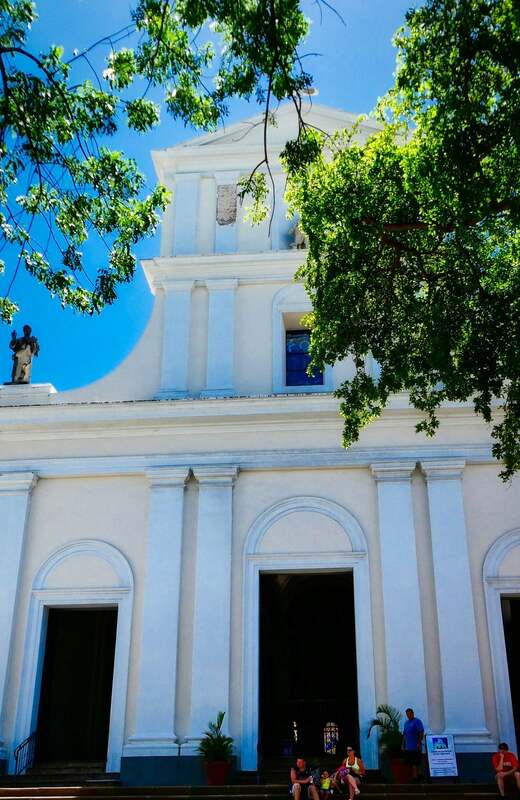 The Cathedral of San Juan Bautista is not as grand as many of the cathedrals you probably have seen, but it is the oldest cathedral in the United States and the second oldest in the Americas. 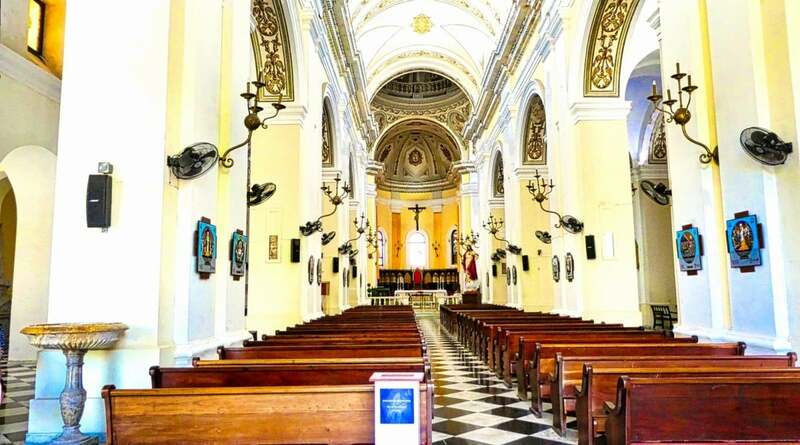 The Cathedral of Santa María la Menor in Santo Domingo, Dominican Republic is the oldest. Constructed from wood in 1521 left the cathedral vulnerable to hurricanes. And no surprise, a hurricane destroyed the building in the early part of the century. It was remodeled many times throughout the centuries and most recently in 1917. 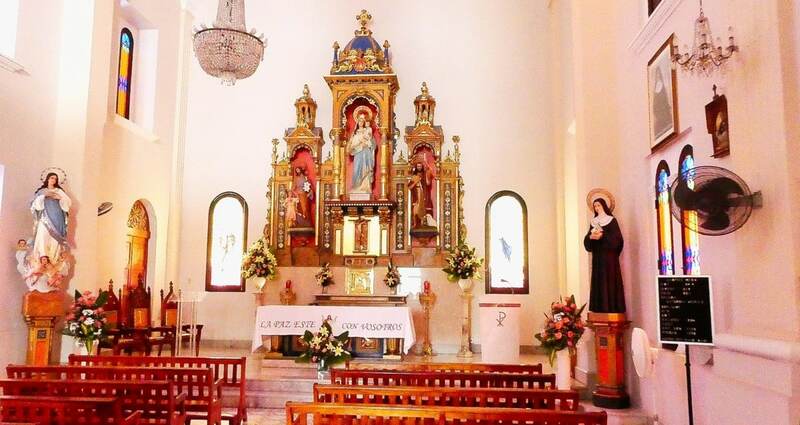 The church located at Calle del Cristo #151-153, just across from the lovely El Convento Hotel is a must see. Mass is still said here, and all are welcome. When you visit, don’t miss the tomb of Ponce de León, the mummy of St. Pio and the wonderful stained glass windows. Also, if you visit at Christmas time, try to attend the Misa de Gallo, on December 24 just before midnight. You will see the cathedral decorated for Christmas, and you can see a re-enactment of the Nativity scene. Plaza de Armas is the original Old San Juan town square. 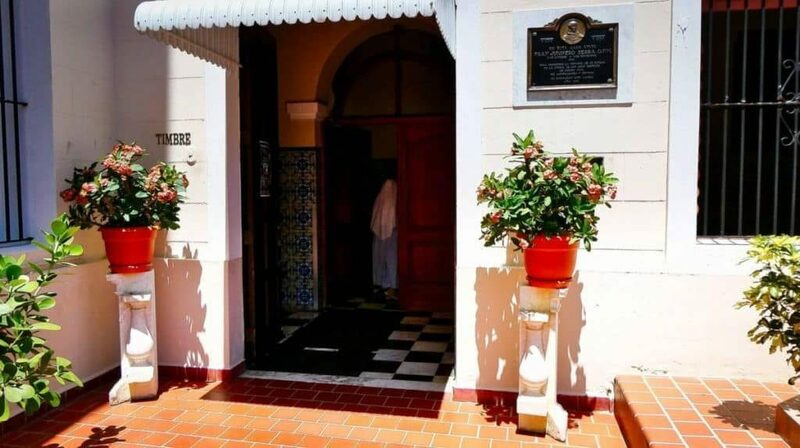 Located on San José Street in Old San Juan. The main feature of the square is a round fountain with four marble statues representing, the four seasons of the year. Tree covered benches line the edges of the square, making it a peaceful place to sit, people watch and admire the public art of the square. 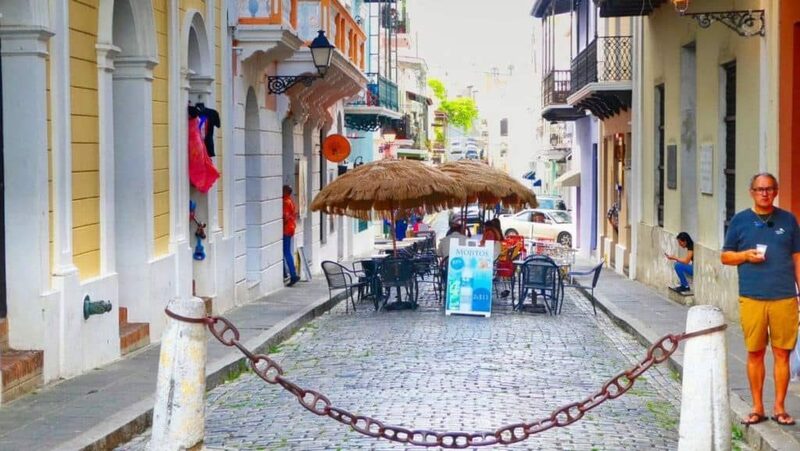 In addition, Plaza de Armas is a place to enjoy a cup of sweet and smooth Puerto Rican coffee, either from the benches in the plaza or from one of the cafes that offer open-air seating in the square. 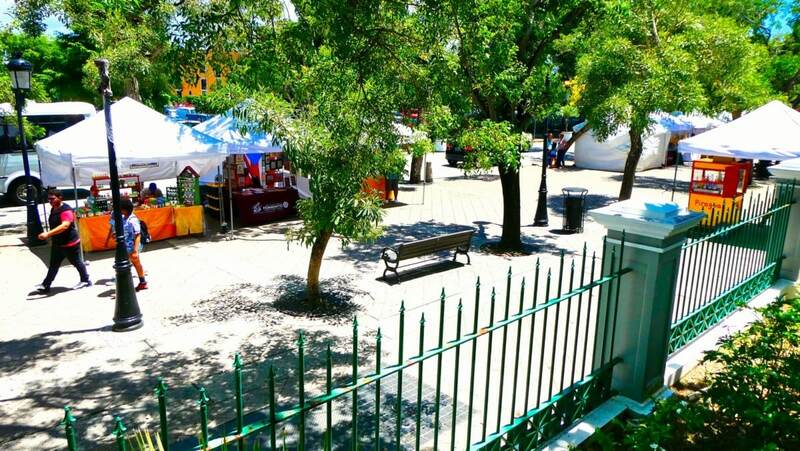 Plaza de Armas is a gathering place for Puerto Ricans. 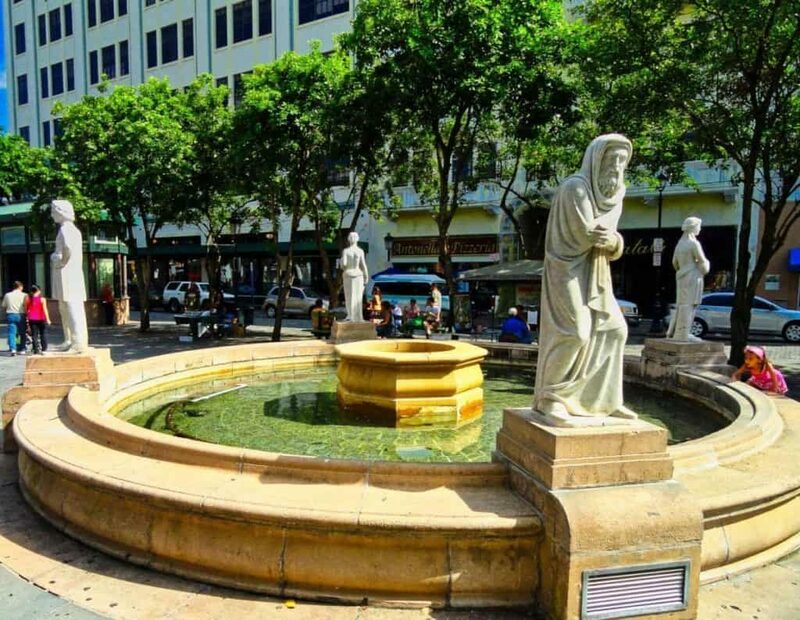 The Plaza de Armas square that has been a focal point in San Juan since the 16th century. There are people selling snack and a lot of people chatting with friends. You can take a seat on a bench that encircles the fountain to watch some of the everyday comings and goings. If you want to mingle with locals Plaza de Armas is the place. People here are friendly and love to talk with visitors. 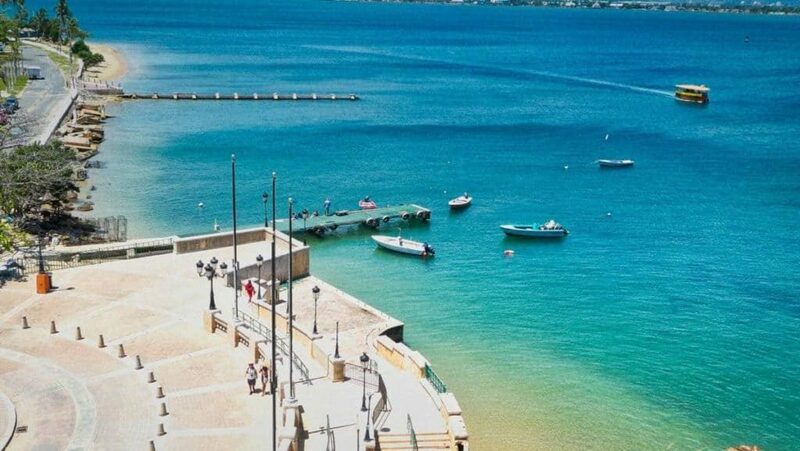 While Puerto Rico was hit very hard by the hurricane, we are happy to say that Old San Juan and the area in Isle Verde where our hotel was located is back to normal and better than ever. This is a great time to visit Puerto Rico. Tourism is a big part of their economy, so visiting helps everyone. We found the crowds were low and had an absolutely wonderful time. For a fantastic place to stay in San Juan check out our post of the Intercontinental Hotel. Thanks Keith and Tina for a great informative article with beautiful photographs. Old San Juan is well worth a visit! 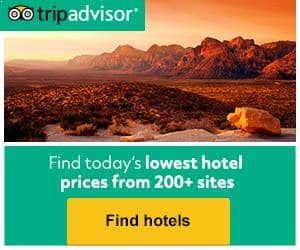 You won’t regret visiting. Lots of fun. I love this post!Thanks for sharing these tips and it is very helpful for beginners.Thank you for sharing. Looking at the amazing pictures of your blog you have compelled me to travel to Old San Juan Puerto Rico. What an amazing detail about the things to do there which is quite useful. 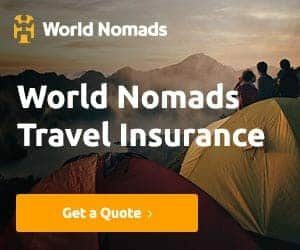 You should visit. It was so beautiful. Thanks for sharing this wonderful experience .and describing your your travelling experience. You’re welcome Brenda. We are glad you enjoyed it.